by The New Yorker Editor · John Updike Author of introduction, etc. From the pages of America's most inﬂuential magazine come eight decades of holiday cheer--plus the occasional comical coal in the stocking--in one incomparable collection. Sublime and ridiculous, sentimental and searing, Christmas at The New Yorker is a gift of great writing and drawing by literary legends and laugh-out-loud cartoonists. Here are seasonal stories, poems, memoirs, and more, including such classics as John Cheever's 1949 story "Christmas Is a Sad Season for the Poor," about an elevator operator in a Park Avenue apartment building who experiences the ckle power of charity; John Updike's "The Carol Sing," in which a group of small-town carolers remember an exceptionally enthusiastic fellow singer ("How he would jubilate, how he would God-rest those merry gentlemen, how he would boom out when the male voices became King Wenceslas"); and Richard Ford's acerbic and elegiac 1998 story "Crèche," in which an unmarried Hollywood lawyer spends an unsettling holiday with her sister's estranged husband and kids. Here, too, are S. J. Perelman's 1936 "Waiting for Santy," a playlet in the style of Clifford Odets labor drama (the setting: "The sweatshop of Santa Claus, North Pole"), and Vladimir Nabokov's heartbreaking 1975 story "Christ-mas," in which a father grieving for his lost son in a world "ghastly with sadness" sees a tiny miracle on Christmas Eve. 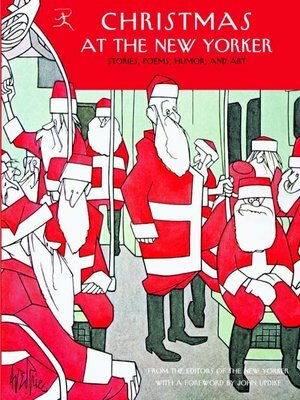 And it wouldn't be Christmas--or The New Yorker--without dozens of covers and cartoons by Addams, Arno, Chast, and others, or the mischievous verse of Roger Angell, Calvin Trillin, and Ogden Nash ("Do you know Mrs. Millard Fillmore Revere?/On her calendar, Christmas comes three hundred and sixty-ve times a year"). From Jazz Age to New Age, E. B. White to Garrison Keillor, these works represent eighty years of wonderful keepsakes for Christmas, from The New Yorker to you.